It’s Steampunk Month at Tor.com. Tor publishes fantasy and science fiction, but their page also has a list of blogs featuring steampunk, news on Seattle’s SteamCon (a steampunk convention, of all things! 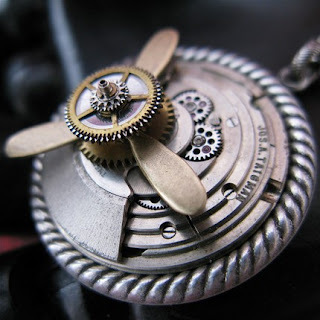 ), and they’ll have features this month on all good things steampunk. And I would be remiss if I didn’t add to yesterday’s ‘definition’ of steampunk: I didn’t come up with anything new or amazing. The only conclusion anyone really has about steampunk is that it’s whatever it decides to morph into next. It’s not only literature, it’s imagination, an aesthetic, a way of life, a cool way to trick yourself out (or your computer), and what have you. The best explanation of steampunk I’ve found today comes from Cherie Priest, who recently wrote another book I’m dying to have, Boneshaker. 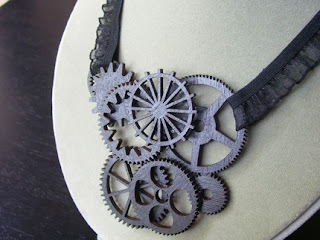 And I’ll leave you with some pretty freaking sweet pictures of steampunk items for sale on Etsy. Enjoy! The Dasha Statement Necklace by jillian 1984.
superlicious! the high tea and fashion show at the steamcon sound like fun. i'm gonna have to see if i can fanagle to drive up for the weekend. Thanks for the great post! The link to Cherie was really good too! So cool! Those bustles are fabulous. They must be a trip to sit down in though! Those clothes are gorgeous. Definitely love the fashion of steampunk. I don't think I've read a steampunk novel yet. Must do so soon. Oh, stunning dresses! I haven't read any steampunk, but it sounds cool. I *swoon* adore the bustle and dress! question of the day - how do women sit with the bustle behind? hmmm. alas, my schedule does not allow me to go to steamcon. boo hoo. Steampunk! I was just reading about Steamcon the other day. I wrote an article about a graphic novelist who created this character, Boilerplate, who was supposedly built in the Victorian era to replace human soldiers in battle. He inserted pictures of his character into real historical photos, and many people have been fooled by his "hoax!" The illustrator, a super-cool guy named Paul Guinan, is going to be at Steamcon. Wow!! 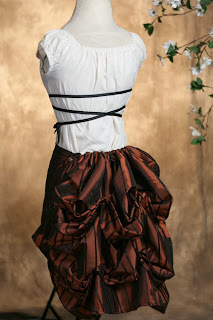 Thank you for featuring my Bustle from Boudoir Noir on Etsy! These are actually pretty easy to sit in! 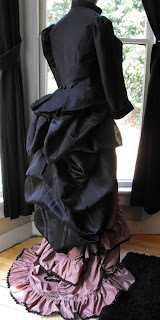 I LOVE Victorian Bustle Gowns. And i've worn them with a Bustle Pillow and without. I wouldn't recommend driving in them...a little awkward LOL! But the rest is a cake walk and pure lovelyness. I missed SteamCon but will be at the upcoming Steampunk Expedition in Seattle (Dec 5th I believe) Thanks for the sweet Blog!